Charly ‘The Immortal’ Matteï (Jean Reno) is an opera-listening ex-gangster who has long left his criminal past to raise a family (or two). Unexpectedly, masked men strike him with twenty-two bullets that put him in a coma. Who masterminded this callous attack? Matteï’s own backstabbing and germophobic childhood friend, Tony Zacchia (Kad Merad), jokingly nicknamed ‘The Godmother.’ Zacchia is also a stutterer but, unlike King George VI, he deserves no sympathy. When Matteï shortly recovers, he embarks on a revenge-killing spree against those who betrayed him. Based upon the novel L’Immortel by Franz-Olivier Giesbert, 22 Bullets portrays the tough dog-eat-dog world of rubbish-strewn Marseille. Criminal underbelly figures are filthy rich and unafraid. Police chiefs are selfishly opportunistic. Why the local council doesn’t hire more garbage collectors, we’ll never know. 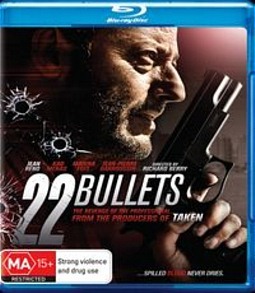 Co-produced by Luc Besson (The Fifth Element, writer of Taken and the Transporter films), 22 Bullets contains a convoluted plot that readily thickens with its multiple mystery subplots. It will keep viewers continually guessing and paying attention to the audio-visual elements for possible clues. Some parts of the film are dramatically fast-paced with intercuts and flashbacks, such as the sequence where Zacchia’s treacherous henchmen are named. If you can’t memorise a whole string of French names while reading flashing subtitles, then this film may irritate you. Keeping within the noir tradition, nearly all the characters are difficult to sympathise with. Nevertheless, Jean Reno sustains our interest as Matteï, the antiheroic patriarch. Marina Foïs, however, outshines her co-star as the hardy widowed police officer Marie Goldman, determined to track down the killer of her policeman husband. Political viewers may feel a bit disappointed with the film’s screenwriting efforts, however, as characters with non-Gallic backgrounds are killed off. This is seen with Matteï’s confidants – Karim, with his Arabian roots, and Pat, with her Vietnamese roots. This idea of family seems to be the central focus of 22 Bullets. Both thugs and police officers alike, no matter how notorious or well respected, have partners and child(ren). However, the fact that tender orchestral music plays every time a major character speaks about family becomes laughable after a while. Like most blockbusters, poetic justice prevails in 22 Bullets. Perpetrators are punished, while the heroes of the day are rewarded, to some extent. The film also neatly offers moral messages about criminality and child rearing, without forcing it upon viewers. Although it is a money-grabber of a film, 22 Bullets is a fairly enjoyable watch. Who wouldn’t want to feel guiltless pleasure from the tortured pain of baddies?